Asylum hand-rolled premium cigars are the creation of Tom Lazuka and Christian Eiroa. Their initiative was not just to build bigger cigars, but to take the concept of cigar rolling to super-sized levels. Asylum is not the first to brandish bigger ring gauges for their premium cigars, but the company has made it their motto that bigger is always better with each of their lines. 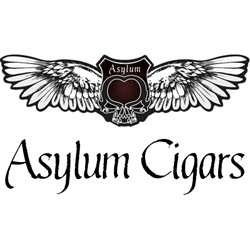 Each of Asylum’s premium cigars are a medium to full body and full flavored smoke, wrapped in Nicaraguan Habano wrappers and packed solid with Nicaraguan tobaccos. Sounds pretty amazing! Whether you go BIG or go traditional, just go Asylum and grab one of these great premium cigars today! Try one of the varieties of sizes and flavors listed below. Each of these styles are available today for a discount price at our online cigar store, Smokers Discounts!